When a bride plans a destination wedding, many don’t think of their cake toppers as top priority. Well, I guess when any bride plans her wedding, a cake topper isn’t a top priority! Many destination brides are looking for ways to keep their luggage light and hauling a cake topper with them just doesn’t make the most sense. 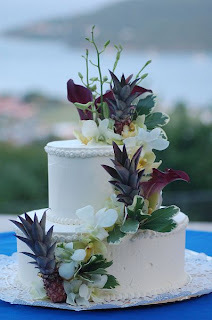 Most destination brides opt for beautiful flowers on their cake to keep things simple but elegant, like the cake above. And while this is a beautiful option, I have to say, I love it when brides add a touch of personality to their cakes. I admit, it’s my favorite, because it’s what I did for my own wedding! 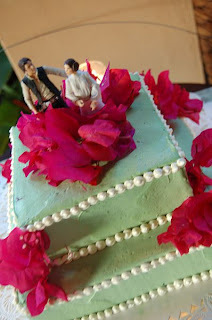 I had so much fun researching personalized cake toppers and finding the company to do this for us. I actually had mine made from a company I found on eBay. They even went to far as to put a little Corona bottle in my groom’s hand and scuba fins on our feet – how perfect! I don’t believe they are in business anymore (it’s been almost 4 years since I ordered it!) but there looks to be some artists on eBay still making similar ones. Search for personalized clay cake toppers. One thing to look for when you purchase a personalized cake topper like this is one that is made with poly-clay – this clay is waterproof & will not mold. Unfortunately, I did not know this when I had my own topper made and we recently had to depart with the mold ridden creation (our tropical environment was not friendly to it, but I’m sure it would have been ok in a cooler climate). If you google these types of cake toppers, a lot of companies out there make them as well. I think if I was to order one again, I would go with www.claymyfigure.com. www.clayfigurines.com and www.designsbydorian.com also looked like fun sites. There are other great ways to personalize your cake as well – don’t feel you have to drop over $100 on one of these babies. It could be as easy as dropping $10 at your local toy store, like this couple did!